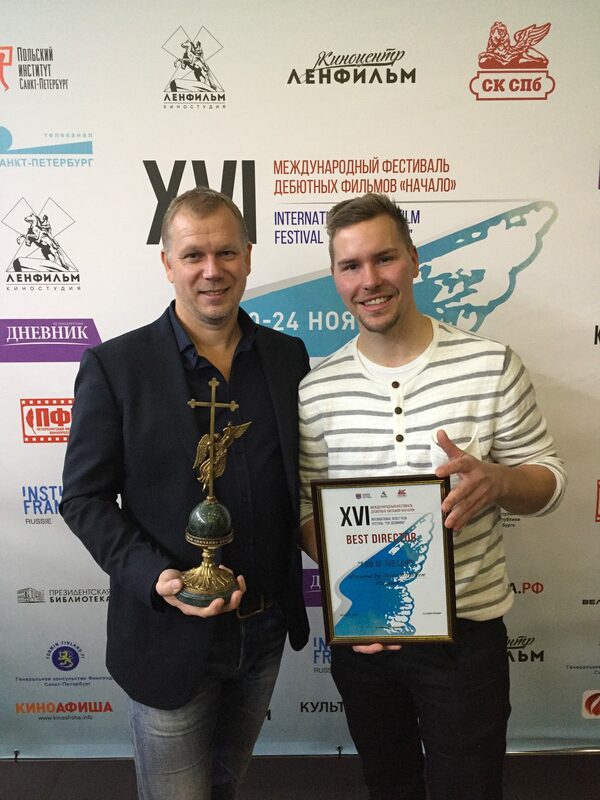 ‘Law of the Land’ (Armoton maa) by Jussi Hiltunen has won the award for best directing at International Debut Film Festival The Beginning in Saint Petersburg, Russia. ‘Law of the Land’ is the debut feature from Hiltunen whose short films have been awarded in several festivals. Director Hiltunen and producer Kai Nordberg accepted the award on Friday November 24. “During the past years Making Movies has invested strongly in young directors. Our previous production Little Wing was also a debut film and it won the Nordic Council Film Prize. A generation of new filmmakers who fulfil the international standards is growing in Finland and we have had the chance to be part of this international breakthrough”, comments producer Nordberg. The Beginning film festival was organised this year for the 16th time with over 100 films in the program. The jury for feature films consisted of chairman and film director Aleksandr Proshkin, director/actor/artist Aleksandr Aalabashjan, festival producer Sergei Nonazhilov, Haiker Stadler from Munich film school, Latvian film director Renaus Vimba, and Nina Romonadovskaja from film site Profcineman. ‘Law of the Land’ is a drama set in a small village in Lapland at the Finnish-Swedish border. Main cast includes Ville Virtanen, Antti Holma, Mikko Neuvonen, Outi Mäenpää, Malin Buska, Andreas af Enehielm, Jørgen Langhelle and Pernilla August. Producers of the film are Kai Nordberg and Kaarle Aho from Making Movies and cinematography is by two-time Jussi Award winner Tuomo Hutri F.S.C. ‘Law of the Land’ premiered in Finland January 2017 and is distributed by Nordisk Film. Producer Kai Nordberg and director Jussi Hiltunen accepting the prize for ‘Law of the Land’.